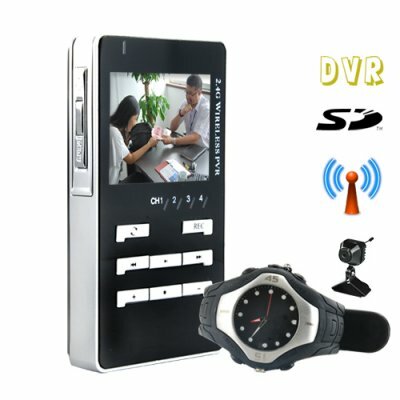 Successfully Added Watch Camera + Wireless Receiver - Ultimate Kit to your Shopping Cart. This wireless kit consisting of a watch camera and DVR receiver is the ultimate covert operations package. The video recording camera in the watch is so small it's practically undetectable and looks absolutely normal on the face of this sports style analog watch while the DVR is pocket sized and can be kept in your pocket, placed in a desk drawer, or even put into the room next door. What makes this " Watch" different than others on the market? This one point - the intelligent mounting of the camera results in the image being correctly orientated when the watch is upside down, so the picture is always perfect when you are naturally resting your arm on a table. As any pro can tell you, with most watch style hidden cameras the video ends up being upside down and needs a lot of editing to make it viewable. This this model we have done the smart thing and put the camera in place so that you can rest your arm and get the video right the instant you record it. This kit also comes with an advanced wireless DVR having a 2.5 inch LCD and a one touch button for instant recording onto any inserted SD card. This 2.4GHz 4-channel video signal receiver uses the latest in wireless signal technology to make sure you can capture all the action clearly at a resolution of 640x480 and with a frame rate of up to 30FPS. This is quite simply the most covert camera we have seen yet and is now available direct to you at Chinavasion's factory direct wholesale price. Easily sell this to your customers on your own internet shop or on eBay for great profits and take advantage of Chinavasion's drop shipping service to maximize your limited resource of time. Get yours today! The product is a universal product that can be used around the world. It supports both the PAL and NTSC color systems. I still do not understand, what position should I be in when recording video? As shown in our picture above, when your arm is "face up" and pointed in the direction of your target, then the video will be recorded so you can view it instantly with no rotation needed.